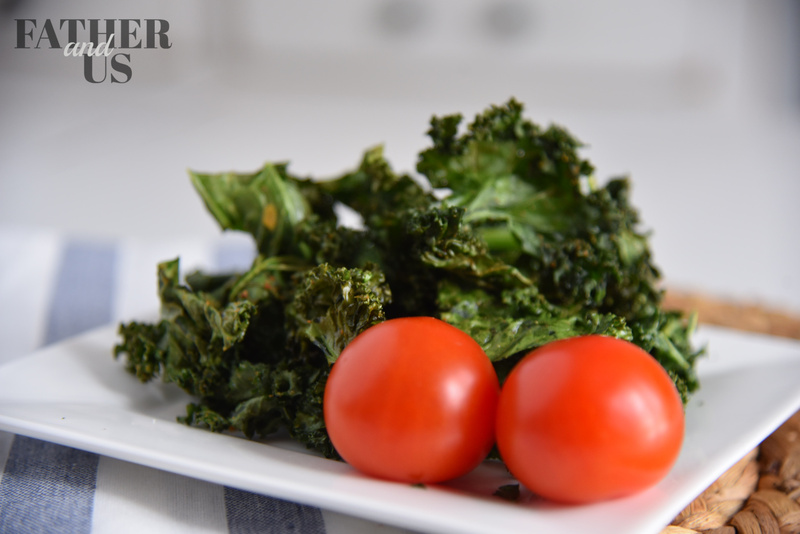 Air Fryer Kale Chips are the perfect thing for any occasion and for any diet. Made with just a small amount of oil, they are the perfect crispy snack! My infatuation with the Air Fryer continues. While my wife has been all over the Instant Pot for the last year, I have delved deep into the depths of the Air Fryer. So, far I’ve made Air Fryer Chicken Wings, Air Fried Buffalo Cauliflower and Air Fryer French Toast Sticks. They have all turned out fantastic! My favorite is probably the Chicken Wings while my kids most certainly would vote for the French Toast Sticks. Every so often, my wife and I participate in the Whole 30 program. 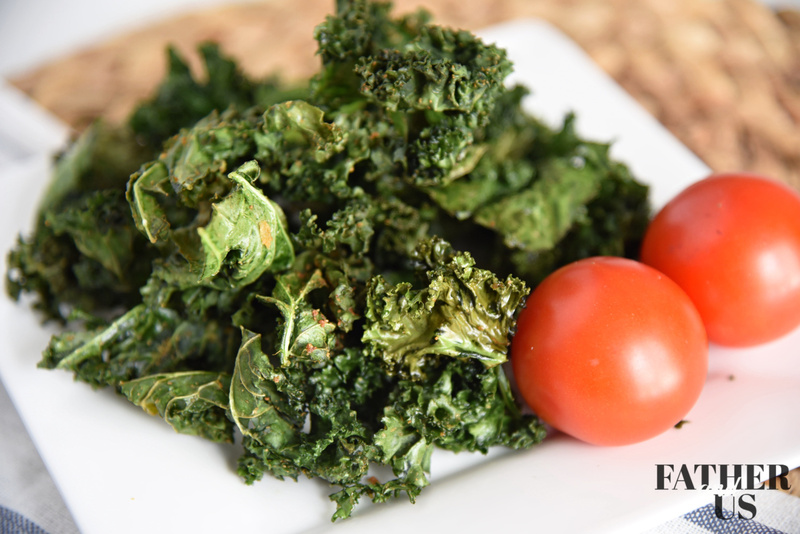 While snacking is frowned upon while you are doing the Whole 30, we have found that Kale Chips are a perfect thing to have lying around. They really satisfy that urge we both love to have some salty fried food like potato chips. Making Kale Chips in a regular oven isn’t that time consuming, but it is kind of a drag to lay them all out on baking sheets. So, during my recent love affair with the Air Fryer, it wasn’t long until I had the idea to make Air Fryer Kale Chips. Have you not been bitten by the Air Fryer bug yet? No worries, I’ll explain it all here! An Air Fryer is a small electrical kitchen appliance that cooks your food by circulating fast moving, hot air around it. It works a lot like a convection oven. But the design of the “fryer” and the movement of the air results in a “crispier” outside much like you would get if you traditionally fried something in oil. When you use an Air Fryer, you use very little or, sometimes, NO oil at all! For instance, you can make some honey sriracha chicken wings in an Air Fryer. They come out super tender on the inside and nice and crispy on the outside. They taste just like they have been deep fried, but they weren’t and your waistline will thank you! You can also make all sorts of desserts in the Air Fryer as well. Making Kale Chips in an Air Fryer is certainly one of the easiest things that I’ve done with this appliance. The process is super simple, just a couple of things to keep in mind. Make sure you remove the stem from your Kale. If you don’t they won’t cook evenly. It is really easy to do. 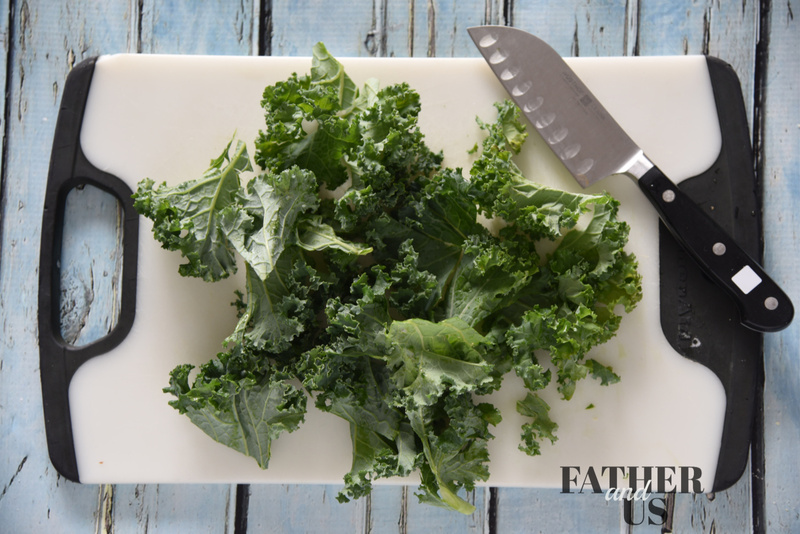 Spread the kale leaf on a cutting board and cut it vertically along the stem. That gave me the two halves of the leaf. After that, I just chopped them into about 2 inch pieces. 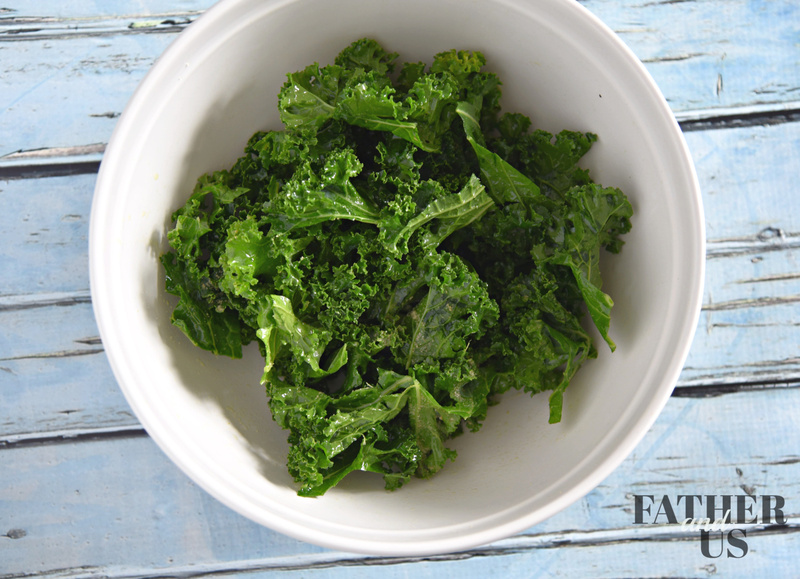 Once you have cut up the kale, simply put them in a bowl. Drizzle the olive oil over them and add your garlic salt and onion salt. Mix thoroughly. You want to make sure to get the oil to cover all of the kale. Preheat the Air Fryer to 370 degrees and cook. I cook mine for about 3 minutes. Then I shake it up. And cook it for 3 more. It is usually pretty close to being done by then. You want your air fried kale chips nice and crispy but not burnt. There is a fine line so keep checking it often. You can dip your air fryer kale chips in ranch or even drizzle some ranch over them. Putting the garlic salt on them really adds a nice kick of flavor! 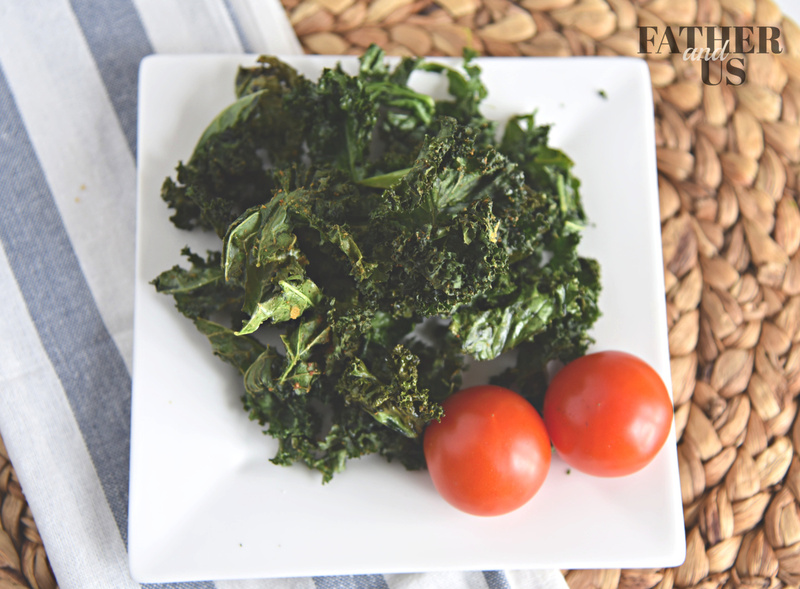 I hope you enjoy these kale chips made in the air fryer!